Bankura horse (Bengali: বাঁকুড়ার ঘোড়া) is the terracotta horse, produced in Panchmura of Bankura district of West Bengal. Its elegant stance mixed with abstract form, is a wonderful piece of art. Originally used for village rituals, the horse now adorns drawing rooms across the world as symbols of Indian folk-art. It is also the logo of All India Handicrafts. This folk art originates long back as terracotta or clay craft; the symbol of man’s first attempt at craftsmanship, just as the potter’s wheel was the first machine invented. In order to cater to the commercial requirements of the modern global market, the village potter is often combining the traditional rural abstractions with refined urban tastes to show pieces of terracotta art. The principal centres where the terracotta horses and elephants are produced are Panchmura, Rajagram, Sonamukhi and Hamirpur. The Panchmura-style of pottery is considered the best and the finest of all the four types. 69/100 was weekday attire, when I was getting ready for my office. While draping this saree, suddenly this idea came to my mind because of its wonderful design and the theme. This colourful bapta silk is a collection from Bardhaman village. The stripes, the colours, are eye-catching where the main highlight is ‘bankura horse’ as a part of the block prints. Back in office we have these horses for decoration. 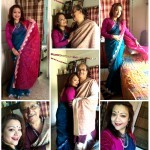 My official photographer Arundhati did not miss this moment. 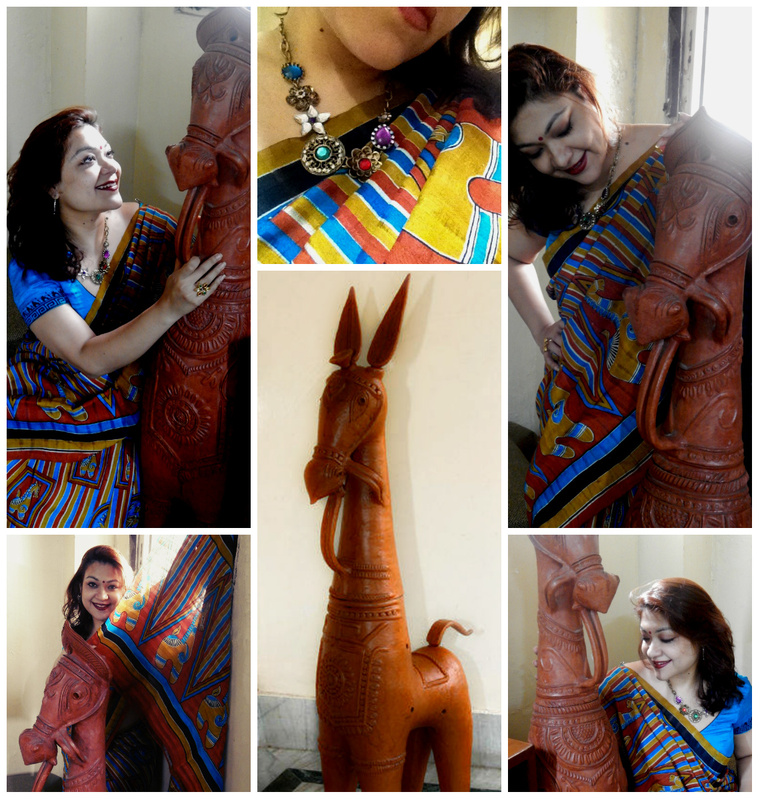 I wore a colorful neck-piece to give that touch and posed with the horse…. Who says, you need a beating heart to realize life? It’s something one needs to feel and get connected.